On November 3, 30 Americans artists with local roots Shinique Smith and iona rozeal brown discuss the local artistic community’s role in their lives in a panel discussion moderated by independent art dealer and consultant Schwanda Rountree; Carrie Mae Weems – this year’s Newman Distinguished Artist in Photography – explores themes of race and sexuality in her art on November 12; join DC-based performance group Gaia on November 19 for the second evening of music, dancing, and performance; and on November 28 Visiting Artist Hank Willis Thomas discusses the cultural and academic sources that inform his work within 30 Americans and Strange Fruit, an accessory exhibition featuring a new body of work by Thomas. In celebration of FotoWeek DC 2011, the Corcoran will play host to a variety of FotoWeek activities, including the kick-off party on November 4, expert portfolio reviews on November 12, FREE noontime lectures November 7–11, special exhibitions – including shortlisted entries to the annual Prix Pictet, on view in North America for the first time – and more. COLLEGE PARK--Md. The Stamp Gallery at the University of Maryland College Park will be presenting their new exhibit by New York based sculptor, Hong Seon Jang, entitled “Sugar High”, curated by Megan Diane Rook-Koepsel. The exhibition and all related public programs are free and open to the public. Installation artist Hong Seon Jang is noted for transforming common products and manufactured objects that are mass-produced and giving them new contexts and aesthetic possibilities. Through manipulation and reintroduction, he strives to displace his chosen materials from their original function in order to challenge the mundane and preconceived ideas we associate with these objects. Hong Seon Jang is a contemporary artist currently based in New York who received his BFA from Dan Kook University, Seoul, South Korea and earned his MFA in Imaging Art at Rochester Institute of Technology, Rochester, NY. MIT's Neil Gershenfeld and Fab Lab are coming to DC! As a part of the SOFALab initiative to bring the science and art communities closer, Hamiltonian Artists with FabLab DC are co-sponsoring an exciting keynote presentation by the founder of FabLab and MIT Center for Bits & Atoms (CBA), Prof. Neil Gershenfeld, on the evening of November 3. Prof. Gershenfeld's talk will be the first of a series of events to help launch FabLab DC. Fab labs provide widespread access to modern means for invention. They began as an outreach project from The MIT Center for Bits & Atoms (CBA). CBA assembled millions of dollars in machines for research in digital fabrication, ultimately aiming at developing programmable molecular assemblers that will be able to make almost anything. Fab labs fall between, comprising equipment and materials that can be used today to do what will be possible with tomorrow's personal fabricators. Professor Neil Gershenfeld is the Director of MIT's Center for Bits and Atoms. His unique laboratory is breaking down boundaries between the digital and physical worlds, from creating molecular quantum computers to virtuosic musical instruments. Technology from his lab has been seen and used in settings including New York's Museum of Modern Art and rural Indian villages, the White House and the World Economic Forum, inner-city community centers and automobile safety systems, Las Vegas shows and Sami herds. He is the author of numerous technical publications, patents, and books including Fab, When Things Start To Think, The Nature of Mathematical Modeling, and The Physics of Information Technology, and has been featured in media such as The New York Times, The Economist, and the McNeil/Lehrer News Hour. He is a Fellow of the American Physical Society, has been named one of Scientific American's 50 leaders in science and technology, has been selected as a CNN/Time/Fortune Principal Voice, and by Prospect/FP as one of the top 100 public intellectuals. Dr. Gershenfeld has a BA in Physics with High Honors and an honorary Doctor of Science from Swarthmore College, a Ph.D. from Cornell University, was a Junior Fellow of the Harvard University Society of Fellows, and a member of the research staff at Bell Labs.
" ...I was not disappointed in the trek, and like all previous Artomatics, I think that I've discovered some new artists whose work is new to me, and whom I think have the potential to use AOM Frederick as the initial stepping stone into other art things." This exhibition features paintings by DC-based artist Champneys Taylor for which he utilizes Brian Eno's 1975 album Another Green World as a generative device. The paintings reflect Taylor's ongoing interest in color, luminosity, and invented landscapes both physical and psychical. This is the artist's first solo exhibition in the Washington area. Produced and presented with poetic undertow. An Avant-Garde pioneer of postmodernism as well as a central figure of the modernism genre, Gertrude Stein (1874, Allegheny, Pa.—1946, Paris) was a very innovative American writer, eccentric Jewish-American expatriate,self-styled intellect and a cubistic art patron. Opening at the National Portrait Gallery features more than 50 artifacts and 100 works by artists from across Europe and American, Stein hungered for recognition within the art community in addition to being a significant published author. Through Five Phases of her life is a portrait presented of Gertrude Stein, closing on January 22, 2012. Porter Contemporary announces Splash!, a group exhibition of thirteen artists in various mediums focusing on color. Porter Contemporary invites everyone to come in their most impressive colors and make their own splash! We invite you to dress in your boldest colors, wear colorful masks in true Halloween spirit, and enjoy the emotionally stirring effects of our colorful show. From ancient Greek philosophers devising connotative meanings to different colors, to color theory principles found in Leonardo da Vince’s notebooks, and Isaac Newton’s theory of colors in the 18th century -- the energizing flow of light transcends time and continues to delight its viewers. Amazingly, humans perceive over 2.8 million different hues. We invite you to let your eyes roam free following the emotionally stirring effects of our colorful show. The exhibition focuses on thirteen artists’ ideas about color and how it manifests itself in the work. Artworks range in medium and include: photography, wood, watercolors, acrylics, oil, ceramics and other mixed medium items. Converse with Georgia Nassikas about her new work, Encaustic Paintings, currently on exhibit in the Ramp Gallery. Georgia will discuss the encaustic process as well as what inspires her. There will also be time to explore Seth Rosenberg: The Cleveland Years, in the Emerson Gallery and Accidentally on Purpose: Paintings by Carolyn Case in the Atrium Gallery. Visit Moop's online collection in person at HEMPHILL. Moop is the brainchild of the husband-and-wife team Wendy Downs and Jeremy Boyle. "Moop specializes in handmade bags for men, women and kids. We design and manufacture every bag, start to finish, in our Pittsburgh studio. We are the mindful labor behind every Moop bag and are firm believers in concise, durable, well crafted design. We love the maker’s life and are constantly looking for ways to be more connected to the people who make the things we love. We support small independent businesses who work hard to do what they love and find ourselves akin to the same practice. You will find us in the studio every day sewing, making, designing and sharing our experience via our blog. We have worked hard to establish a business that is always looking to improve and grow. We hold thoughtful design and product integrity to be among our achievements. We believe that form does follow function and work hard to bring you bags that hold up to our own high standards." Pulitzer Prize-winning author Isabel Wilkerson discusses her work, The Warmth of Other Suns: The Epic Story of America's Great Migration. Like Jacob Lawrence’s The Migration Series, the book recounts the story of the nearly six million black Americans who fled the South after World War I. As part of Funding for the Arts Month in October, Kim Patton from the Foundation Center comes to Hamiltonian to give an overview of foundation fundraising for individuals working in the arts. As part of KCDC's All Corners Internet Conversation Series this talk will compare and contrast wide-ranging museum design research with the real life settings of Elsewhere Living Museum and will approach the questions: What does your museum of the future look like? What would be its manifesto? How would it work? At the end of the conversation, the audience will be invited to pose questions to the presenters and to submit their own ideas for a zine that will be created from this conversation. Pablo Frankenburg is a scholar of museum studies pursuing his doctorate at the University of Tuebingen, Germany. Frankenberg has been conducting research in Asia, Europe, and the Middle East, asking museum consultants: What Makes the Ideal Museum? Stephanie Sherman is co-director and Chris Kennedy is education curator at Elsewhere Living Museum in Greensboro, North Carolina. Elsewhere is a three store building housing one woman's 58 year collection of thrift and surplus, which has become a living installation curated by hundreds of contributors over a 9 year period. Today, Elsewhere is a space to investigate creative collaboration, through community events, a residency program, and educational initiatives. This Google+ conversation is hosted by the University of California, San Diego Art Department. This KCDC class will be an exploration of the notion of 'limbic resonance', the scientific term for the unspoken communication that occurs between mammals in physical contact with one another. Taking form as an internet chat with artist Fiona Hallinan speaking from Ireland, the class itself challenges the possibilities of non-present communication. Can we replicate the experience of presence virtually? Using methods of anecdote, meditation and video trickery, the class will play with notions of embodiment and physicality, ultimately questioning whether true connection can be created through technology. 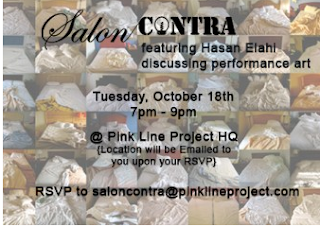 This Google+ conversation is hosted at Agitprop in San Diego, California. While the interior of Transformer's gallery space is in use for receiving and storing artwork for the 8th Annual Silent Auction & Benefit Party (taking place November 18 at the Corcoran Gallery of Art), they will be presenting a series of rotating video works in their storefront window space for sidewalk viewing. Each day a new work will be on view in storefront window to be experienced from the sidewalk. This program is being developed in collaboration with the Hirshhorn's new ArtLab + design studio for teens. Stay tuned to Transformer's website and Facebook for a schedule of works on view! Hillyer Art Space is currently looking for artists to exhibit their works for 2012-2013. Artists must be DC Metro area residents or international artists, and cannot have had a solo show in the past 3 years. Submissions must be received by October 28, 2011. Resume including address, email, phone number, education, previous exhibitions, etc. Because Hillyer Art Space presents international exhibitions alongside works of local artists, our program guidelines require that artists must be living and working in DC, MD, VA, or abroad. Please be aware that it may be some time before you hear back from Hillyer Art Space plans its exhibitions and programs between one and two years in advance. Please do not call to follow up: they will contact the artists in whom they have an interest. Artists may deliver proposal materials via mail or email. Provide a self-addressed stamped envelope if you would like your materials returned. Zenith Gallery founder/director Margery E. Goldberg has been a major player in the Washington arts community for three decades as an entrepreneur, curator, wood sculptor and activist, and in this show she shines a spotlight on artists with whom she has worked and collaborated over the years. All have recently been recognized for their talents, in a new book by Ashley Rooney, 100 Artists of the Mid-Atlantic. Artists: Alan Binstock / F. Lennox Campello / Joan Danziger / Julie Girardini / Margery E. Goldberg / Robert C. Jackson / Michael Janis / Joan Konkel / Anne Marchand / Donna McCullough / Davis Morton / Carol Newmyer Marc Rubin Barton Rubenstein / Sica / Ellen Sinel / Betsy Stewart / Cassie Taggart Tim Tate / Erwin Timmers / Paul Martin Wolff / Joyce Zipperer. This is such a great opportunity to walk or bike in the neighborhood and see some exciting art! You can purchase original art for holiday gifts or for that discerning friend that you want to impress. As I toured the studios of some of the Mid City Artists today, I was reminded of how wonderfully creative and liveable our neighborhood is. Besides seeing the artists in their studios, I stopped by several shops which are business supporters of the Mid City Artists. Good coffee, good food, good chocolate, good art, good design, good gifts, good, good, good! What more can we ask for. Check the businesses out on the maps which are available at the artist studios. Carmel and the new Room & Board Home Furnishings Store located at 14th and T St. NW are two of many businesses and galleries collaborating with Mid City Artists during the weekend of the Fall Open Studios. If you get out tomorrow, enjoy the fall splendor, indulge your eyes with the beauty of art, meet the artists and support this wonderfully creative aspect of our community, the Mid City Artists. Stop by Regina Miele's new space on 14th Street. She just moved in across the street from Raven Arts. Regina has a brand new light filled space which houses her studio, frame shop in back and a gallery with street level access. It's as inviting as she is and presently filled with some of her beautiful oil paintings. harmon art lab is the creation of artists Peter e Harper and Thomas Drymon and is just down the street in a space that houses a gallery and artists studios on the upper floor. HAL is a creative collaboration that ties art curator, artist and viewer into an interactive dialogue of ideas and engagement. Painter Sally Kauffman just moved into her new studio in the building where you can see her oil and acrylic abstract paintings. Painter Sally Kauffman in her studio. Robert Weiner is the artist behind DC Art Glass. The studio is filled with his signature Colorbar Murrine Series as table and wall sculptures and lighting sculpture, along with affordable jewelry that shimmers as diachronous glass bracelets, necklaces and earrings. I was particularly drawn to his new cone bowls in gold and green tones. There are also select creations of bowls in solid colors, of which my favorite was red. Simply gorgeous! I'm always delighted to step into the studio of found object sculptor Chuck Baxter. It's a mixture of delight and recognition of the found objects that are transformed into whimsical sculpture. Chuck Baxter in his Studio. While I was checking out his work, a music box sculpture was purchased by someone as soon as they heard it. The person was reminded of her childhood from the bits and pieces and sounds of the piece. Chuck's work is definitely a must see! 21 Member Artists are Opening Their Doors to the Public and it's free to go see them. Plan your visits in advance by flipping through the artists' pages online to see what you like, who is new, and who is participating. The Fall Open Studios runs from 12 to 5 PM on Saturday and Sunday, October 22 and 23. Spend your weekend visiting Mid City Artists and see the community on foot, bike or public transit. Download the map to guide you along. Use the Capital Bikeshare program to get around. Find more information and a handy reference map. http://www.midcityartists.com/. You'll be able to pick up a printed map at many of the locations. Have fun and buy some art! Reed has been shown shown domestically and abroad, including The Baltimore Museum of Art, Baltimore, MD; The International Gallery of the Smithsonian Institution, Washington, DC; The Center for Book Arts, New York, NY; The Washington Print Club; VisArts, Rockville, MD; The Southeast Center for Contemporary Art, Winston-Salem, NC, and The American Center, New Delhi, India. Her work is included in the permanent collection of the National Museum of Women in the Arts, among others. October 22, 2011 at 2:00 p.m. Organized on the occasion of the National Gallery of Art's Warhol: Headlines exhibition, on view from September 25, 2011, until January 2, 2012, this symposium features four lectures, each offering new perspectives from which to consider Andy's Warhol's multifaceted treatment of the media. Illustrated lectures will be presented by Thomas Crow, Rosalie Solow Professor of Modern Art and associate provost for the arts, Institute of Fine Arts, New York University; Jonathan Flatley, associate professor of English, Wayne State University; Neil Printz, editor of The Andy Warhol Catalogue Raisonne; and Fred Tomaselli, artist. Molly Donovan, associate curator of modern and contemporary art and curator of Warhol: Headlines, will introduce each speaker. Bringing the news headlines to life! …through a multimedia experience of overlapping performance and visual art we explore the ironies and idiosyncrasies of the mainstream news narrative. This event is part of the “WARHOL OFF THE MALL” series, a collaboration between Busboys and Poets and the National Gallery of Art. internationally based emerging & established artists. The Highly Anticipated Return of DJs Yellow Fever! ONLINE TICKET PURCHASES NOW AVAILABLE!!!!! 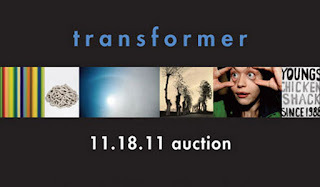 Please visit transformergallery.org for a list of all participating artists and sponsors. Project 4 presents “Dealing,” a solo exhibition featuring new work by Agnes Bolt. Bolt is an interdisciplinary artist who uses photography, video, installation, and intervention in her art practice. Percy Martin is a printmaker and teacher of art who has lived in the Washington, DC area since 1947. For over 25 years, he has been quietly working on a series of lush and technically complex prints detailing the daily lives and rituals of the Bushmen, a mythological people and culture born of Martin's imagination. He studied printmaking and graphic design at the Corcoran Gallery of Art where he received a Ford Foundation Fellowship in 1966. 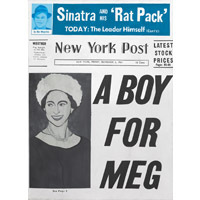 In 1975 the National Endowment for the Arts awarded him with an Artist-in-Residence. Mr. Martin taught private classes in etching and has been the Director of the W.D. Printmaking Workshop in Washington, DC, since 1947. He taught at the New Thing Art and Architecture Center, University of Maryland, Corcoran School of Art, printmaking to inmates at Lorton Prison, the Duke Ellington School of the Arts and finally the Sidwell Friends School, from which he is now retired. Mr. Martin has shown his work widely in the U.S., Russia, the Ukraine, and Africa. His works have been in traveling exhibitions of the Smithsonian Institution and are found in numerous private collections and the collections of the Washington Post, University of Maryland, and the National Collection of American Art. Attitude – Paintings by Josephine Haden. October 21 through December 8, 2011. Artist’s Reception Friday, October 21, 5 to 7:30 p.m.
A nationally recognized artist, Ms Haden is known for her signature take on landscape paintings. Not quite surreal, they often appear exaggerated and vast and seem as if they will spill off the canvas. Adding to the abstract aura of her art, Ms. Haden often adds a bizarre twist that can make the piece appear eerily dream-like or nightmarish. Marymount’s Barry Gallery is located in the Reinsch Library on the University’s Main Campus, 2807 North Glebe Road, Arlington, VA. The Gallery hours are Monday through Thursday, 10 a.m. to 8 p.m., and Friday and Saturday, 10 a.m. to 6 p.m.
For more information, visit the artist’s web site at www.josephinehaden.com. Glenn Arthur's "The Mechanics Of Seduction" is a series of paintings exploring the fascination, power and sensuality found within the human machine. Inspired by an era defined by industrial enlightenment and artistic innovation, Glenn fuses together a fanciful blend of elaborate and historical aesthetics. Each delicately painted female entices the viewer through mechanical elements while alluring them with hypnotic beauty into a world of ornate elegance wrapped in a cloak of disquieting surrealism. The juxtaposition of organic emotion and unfeeling apparatus demonstrates the unyielding, seductive romance between human and machine reminding us of the inherent desires that fuel us all. Glenn Arthur is a self taught visual artist from Orange County, California. Glenn has been diligently working on creating his own brand of beautifully painted images. Using acrylic paints on wooden panels, he adds in elements and influential symbols of his past and present to each piece. Touching on themes of love, death, conflict and duality, Glenn’s art tells stories of strength and hope through emotion and sentiment with his sensual beauties and signature hummingbirds. Smith Center for Healing and the Arts has announced an upcoming exhibition of Tom Wolff's U Street Portrait Project, a new photographic exploration of the people and culture of D.C.'s U Street neighborhood, to open at the Joan Hisaoka Healing Arts Gallery later this month. Nationally recognized photographer Tom Wolff is best known for his published work in the Washington Post Magazine, House & Garden, Garden Design, Smithsonian Magazine, and New York Times Magazine. This fall he focuses closer to home with his most recent series, U Street Portrait Project, capturing the local business owners, residents, and artists that together make D.C.'s U Street Corridor a rich and diverse cultural center. Wolff looks beyond the facades to meet his subjects and engage the individuals that make up this incredible neighborhood. His approach is simple; walk into a store just as one would in their daily routine, strike up a conversation, and ask for a photograph. Accordingly, when viewing Wolff's portraits one begins to feel like he/she is paused in an intimate conversation with the subject, and it is at that moment that Wolff has reacquainted us with our neighbor. He encourages us to stop, see our neighbors, and recognize that this vibrant neighborhood is not just comprised of the trendy new restaurants or bars, but also the people who enliven and enrich this community. The show's sponsor, Smith Center for Healing and the Arts, has itself been a fixture on U Street for almost a decade, offering arts, education, and health programs for the community, with a special focus on those affected by cancer. Driven by the core belief that participating in the arts is life-changing and crucial to the healing process, the organization opened its gallery space in 2008 to explore this connection and to show exhibits that educate, enlighten, empower, and cultivate healing. The U Street Portrait Project will run from October 28 to December 17, with an opening reception on Friday, November 4 from 7-9 pm. The Joan Hisaoka Healing Arts Gallery is located at 1632 U Street, in Northwest D.C. The Gallery is open Wednesday to Friday, 11am-5pm and Saturday, 11am-3pm, and by appointment. Help make this project possible by supporting it through Kickstarter page. HARD ART DC 1979 is a forthcoming book and traveling exhibition of photographs by Lucian Perkins with writing by Alec MacKaye and a contribution by Henry Rollins. The exhibition is curated and edited by photographer and photo editor Lely Constantinople and Jayme McLellan, director of Civilian Art Projects, Washington, DC., with photographs being shown as a group for the first time. Years later, in 1995, Lely Constantinople was hired by Perkins to manage his extensive photographic collection spanning a twenty-five year career with the Post. While looking through negatives in his basement, she found the punk images and recognized MacKaye, her then boyfriend (now husband). She asked to make contact sheets to show him, thinking he might recognize himself and others, and was surprised by how excited MacKaye was to see the images. "Those pictures were the holy grail! Not that many people brought cameras to shows then so I always wondered who he was and what happened to the pictures he took. He was at some of the best shows." MacKaye's text offers an intimate exploration of the moment from two perspectives: that of a fourteen-year-old experiencing music on his own terms for the first time, and a look again at a movement that fueled an underground generation musically and philosophically. His examination is not a nostalgic review of glory days gone, as much as a present conversation about the continuation of a way of thinking that still endures. HARD ART DC 1979 is an intimate snapshot of "the time before the time" that punk rock found firm footing in the U.S. These images capture the cathartic, infectious energy present in any group of people who seek to change their communities through music and art. This exhibition is scheduled to tour to the Good Children Gallery in New Orleans, LA and the Jann Alexander gallery in Austin, TX for the SXSW Music Festival. More tour dates to come. Lauren Gentile, longtime art professional and former director of Irvine Contemporary, sets up shop in Washington, D.C. After serving as the Director of Irvine Contemporary and working in the art profession for 13 years, heading to New York or Los Angeles, might be the conventional wisdom. Instead, inspired by Washington’s promise of becoming a major national platform for emerging and contemporary art, Gentile is committing her considerable talent, energy, and creativity to opening her own gallery, Contemporary Wing. 54 " x 17" x 13"
Sculpture 1275: Emily Williams is the sixteenth in a series of ongoing exhibitions presented by the Washington Sculptors Group (WSG) in partnership with Axent Realty. The 2011 Sculpture 1275 exhibition series was curated by Washington artist Lou Stovall. This current series of carved wood assemblages plays with ideas of functionality and the handmade. Implements and objects with a history or functional purpose have always inspired my sculpture. I am drawn to historical carved scrimshaw and distressed wind vanes, as well as the giant whirligigs of the visionary artist, Vollis Simpson. These toy-like sculptures focus on simple mechanical forms which suggest wind vanes, motion, and balance. I combine gears, propellers, and pinwheels with carnival-like figures which seem to laughing. The carved figures are perched upon their rotating propellers with remnants of color suggesting objects whose time has past yet they continue to point to an uncertain future. The Washington Sculptors Group (WSG) is a volunteer, non-profit organization dedicated to promoting awareness of sculpture and fostering exchanges among sculptors, sculpture enthusiasts and the public. Organized in 1984, membership has grown to include almost 400 area artists. The WSG sponsors frequent public programs and organizes professional sculpture exhibitions juried by prominent curators. Inspired by the words of Spanish poet Antonio Machado, “Caminante no hay camino, se hace el camino al andar…” Traveller, there’s no road. The path is made as we travel. In celebration of Hispanic Heritage Month, local Latin American artists join to explore their journeys through art and life in the US. Come and enjoy canvas of colors and symbols deeply rooted in the cultures of Chile, Costa Rica, and Mexico. Born in Santiago, Chile and lives in the DC area since 1973. 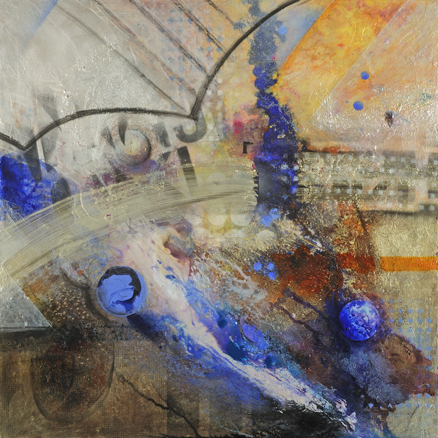 Elba has studied art at the Corcoran School of Art, The Art League in Old Town Alexandria and Georgetown University, and has exhibited in DC, Miami, New York and New Delhi, India. Her palette varies widely demonstrating a strong sense of color, intimacy and freedom. Raised in Chile and born in US, holds an MFA from Vermont College, and a BFA in painting from George Mason University. Her paintings have been featured in several publications and CD covers. She teaches art and is involved in the local DC art community. Born in Villahermosa, Mexico, holds a BFA in painting from Universidad de Queretaro, Queretaro, Mexico. He has exhibited throughout Mexico and the Washington DC Metro area to and in other locations in the USA. He teaches painting, printmaking, drawing and encaustics. (www.gloriavaldes.com) Born in Michoacán, Mexico. Self taught artist inspired by the culture of the Tarascan ancestral people from which she interrelates her work, colors and shapes, and draws an artistic identity. Gloria has exhibited throughout the DC area. The Pastrana Tapestries—among the finest surviving Gothic tapestries—will be on view together for the first time in the United States at the National Gallery of Art, Washington, from September 18, 2011, through January 8, 2012. The Invention of Glory: Afonso V and the Pastrana Tapestries will feature the recently restored set of four monumental tapestries that commemorate the conquest of two strategically located cities in Morocco by the king of Portugal, Afonso V (1432–1481). Since the 17th century the tapestries have been the property of the Collegiate Church of Our Lady of the Assumption in Pastrana, Spain, just 50 miles east of Madrid. Because of their outstanding quality and historical significance, the Spanish government listed them as cultural patrimony to be safeguarded during the Spanish Civil War. Only one of the four tapestries has traveled previously to the U.S.; The Conquest of Tangier was included in the landmark National Gallery exhibition Circa 1492: Art in the Age of Exploration in 1991–1992. Robin Cembalest, executive editor of ARTnews and galleries columnist for Tablet magazine, gives the First Annual Ann Loeb Bronfman Memorial Lecture at the Washington, D.C. JCC, October 22 at 7 p.m. In the talk, Cembalest, former arts editor of the Forward, will reflect on her career covering Jewish art ranging from ancient Hanukah lamps to cutting-edge video art. And she will discuss what “looking Jewish” is all about. When Anne Marchand envisions painting, she sees music in every stroke. 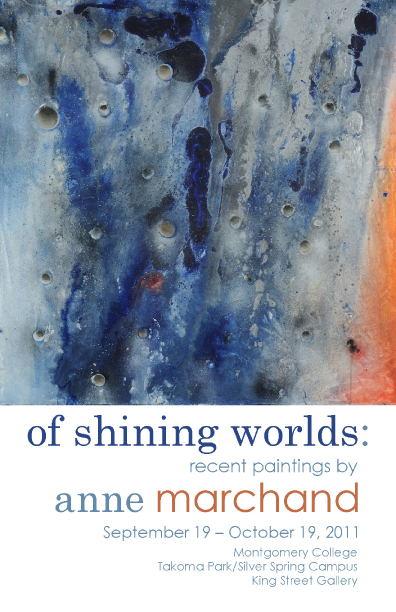 It was a natural leap to include sound in her current exhibition, Of Shining Worlds: Recent Paintings by Anne Marchand on view at Montgomery College. Marchand spoke with composer Steven Rogers about creating musical compositions for her exhibition. The dialogue led to a whole new way of listening to the music. In Steven’s most recent collaboration of music and visual art, he composed fourteen pieces of meditative, peaceful, ambient music for artist Anne Marchand's painting exhibition. Inspired by Marchand’s use of color, texture, and swirling vortexes of outer space imagery, Steven composed his compositions as companion pieces to each of the paintings which serve as soundtracks to the works. The music was played during the opening reception. Gallery visitors can still hear the music on their smartphones during the exhibition. Barcodes on the walls designate paintings with musical scores. Visitors can download a barcode reader to their smart phones, scan the barcode, start playing and listening to the music through their earphones. Looking at the painting and hearing the music is a unique, interactive and personal experience. Rogers and Marchand also collaborated to put the music and visuals on a new website: www.ofshiningworldsmusic.com where anyone can see fourteen of the works and listen to their musical compositions. The music is available for purchase online at stevenrogers.bandcamp.com. Any inquires about the music can be addressed to Steven at stevenrogersmusic [at] me.com. The paintings are available for purchase at www.annemarchand.com through Marchand Studios. Any inquiry about the paintings can be addressed to Anne at art [at] annemarchand.com. Anne Marchand is a professional artist residing in Washington, DC. Her paintings express the power of color, poetry, curiosity and discovery. Her themes include mystic poetry, interconnection, energy, outer and inner space and music. She holds a Bachelor of Fine Arts degree from Auburn University where she studied Painting and Drawing. Anne also holds a Master of Fine Arts in Painting from The University of Georgia. Anne was awarded an Artist Fellowship in 2009 from the DC Commission on the Arts and Humanities. She was awarded a CAP/MEX EX Residency Grant to Culiacan, Mexico in 2003 from the Mid Atlantic Arts Foundation & the DC Commission on the Arts & Humanities. In 2002, Anne was nominated for Excellence in Artistic Discipline in the distinguished DC Mayor's Arts Awards. She has designed and won mural competitions notably in 2005 and 2001 through the DC Creates Public Art Program. Her work was included in a Visions Award from the Committee of 100 to the Westminster Neighborhood Association in 2003. Anne's paintings are represented in corporate and private collections in the USA. She has exhibited extensively in the United States for the past 30 years and internationally in Mexico. Steven Rogers is a composer, saxophonist, and teacher currently residing in Washington, DC. His compositions and performances encompass a number of styles including jazz, fusion, computer generated music, and concert band/orchestral pieces. He holds a Bachelor of Arts degree in International Affairs with a minor in Jazz Studies from The George Washington University where he studied saxophone with Peter Fraize and composition with Dr. Douglas Boyce. Steven also holds a Master of Music in Music Education from The Boston Conservatory where he completed his graduate thesis on the use of nonverbal communication and instruction under the guidance of Dr. Rhoda Bernard. Upon completion of his MM, he was awarded membership into The Pi Kappa Lambda National Music Honor Society. He has composed, arranged, and performed with several ensembles in the DC area and has also performed with The Dave Brubeck Quartet, The Preservation Hall Jazz Band, opened for Rahzel (of the hip-hop group The Roots) and had his compositions performed at the Kennedy Center Millenium Stage and The Shakespeare Theater Company. open Monday-Friday, 8:00 AM-4:00 PM and Saturday, 10:00 AM – 4:00 PM. Opening Reception Saturday Oct 15 6:30-8:30 p.m. In his most recent work, Mr. Belmar uses iconic images - a typewriter, a spinning top, a bicycle - to recount the personal history and story of each image. These nostalgic images allow us to examine our collective memory, often with irony and humor. Many of the objects he depicts are obsolete, but he marvels at the evolution of technology and the inventions that have replaced them. Using a technique perfected over many years, Mr. Belmar uses hand painted sheets of mylar and plastic, carefully arranged from light to dark, and plays with light and the sculptural three dimensionality that emerges. His works reference a time in our past that is impossible to recreate, but important to remember. Ms. Chang, like Mr. Belmar, works with themes of time, change and a glimpse at the inner psyche. Her installations are comprised of individual, exquisite works of art, all connected to each other and site specific. They evoke landscapes, both internal and external, and are concerned with how site and environment shape and evoke mental states. She too marvels at the brisk change of today’s world. Though the art is deeply personal, viewers will recognize iconic images from architecture, construction, transportation, and symbols from both Eastern and Western Culture. Ms. Chang works in mixed media and, like Mr. Belmar, her works are layered and include materials such as watercolor, paper, thread, collage, photography and wood. Joan Belmar was born in Santiago, Chile and emigrated to Spain where he began to paint professionally. Mr. Belmar then moved to Washington DC in 1999, and was granted permanent residency in the U.S. based on extraordinary artistic merit in 2003. He has shown at the WPA and the American University Museum, and was a Mayor's Award Finalist in 2007 as an outstanding emerging artist. In 2009 the DC Commission on the Arts and Humanities awarded him an artist fellowship grant and in 2010 he was awarded an Individual Artist grant in Painting from the Maryland Arts Council. Mei Mei Chang received her Master of Fine Arts in Photography from Ohio University in 2002. She has exhibited her work in over thirty solo and group exhibitions. She has shown at the Takoma Park Community Center, Hillyer Art Space, the (e)merge Art Fair and the Addison Ripley Gallery. She has received numerous awards and residencies, including at the Vermont Studio Center and the Great River Art Association, and has just completed her ARCH Residency at Honfleur Gallery in Anacostia. Sculpting Outside the Lines will be the third biennial exhibit of outdoor sculpture in the Foggy Bottom Historic District, Washington, DC. 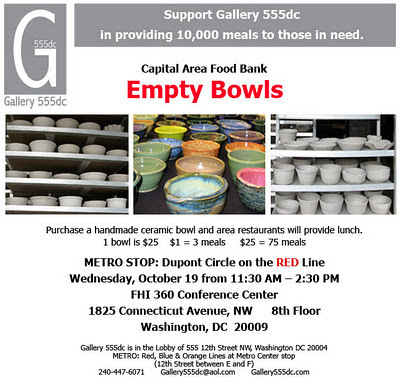 Arts in Foggy Bottom, a project of the Foggy Bottom Association, sponsors the exhibit. The goals of the Exhibit are to (1) enrich the cultural environment of the Foggy Bottom community by providing exposure to the visual arts, especially sculpture; (2) create educational opportunities for residents, non-residents and students as they relate to the visual arts; and (3) draw the attention of people who live outside of Foggy Bottom to this unique, historically-significant residential neighborhood. New York, NY. 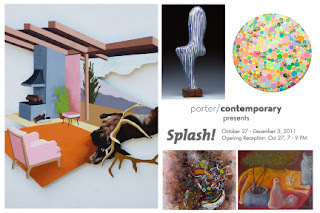 Porter Contemporary announce Splash!, a group exhibition of thirteen artists in various mediums focusing on color. The exhibition opens to the public with a wine reception on Thursday, October 27, from 7 - 9 PM when Porter Contemporary invites everyone to come in their most impressive colors and make their own splash! “Splash! is intended to be fun and exploratory as we head indoors in the winter months” says Owner/Director, Jessica L. Porter. “We have had some serious exhibitions over recent months and my hope was to lighten things up and talk about something as basic yet complex as color”. The exhibition focuses on thirteen artists’ ideas about color and how it manifests itself in the work. Porter Contemporary reached outside their normal repertoire of artists and held an open call to not only receive images for consideration but also artists’ thoughts on color. Artworks range in medium and include: photography, wood, watercolors, acrylics, oil, ceramics and other mixed medium items. Many of the works are abstract and dissect different subject matters that range from the middle-America cut outs by Lori Larusso to Aoife O’Donnell’s photographs of cancer cells. Jennie Barrese explores change and how in order to grow, we must first let go and leave behind certain things in order to survive. Drawing from her painting and textile background, Tegan Brozyna’s current work focuses on the relationship of space or place and it is inspired by the way humans dissect, reconfigure and relate to our world as well as how the natural world interacts with and affects humanity. Born in Russia, Sergey Dikovsky draws his inspiration from the world around him- words, sounds, places and images. Reluctant to paint due to colorblindness, Dikovsky worked in black and white for many years. Over time, his desire to paint in color overwhelmed his fear and now he follows his intuition to create colorful worlds. Painting allows Daina Falk to indulge her strange obsession with doors and her enthusiasm for vibrant colors, strong, clean lines, and the vivid interplay of lights and darks. A native of South Korea, Jihay Kang, uses iconic images associated with Western material culture to explore intersections of consumerism and authenticity. Lori Larusso explores the unavoidable contradictions which exist in our personal and collective systems of belief by pointing to the complexity of individual situations. Very often, our ideals are a reflection of the way we wish things were, rather than a product of the way we actually experience them and she finds this conflict to be in direct connection to the representational image. Andrew Maglathlin focuses on sculptures of ambiguous forms in order to provoke inner thoughts and feelings by stimulating unconscious emotions. Fascinated by the emotional power of color, music and poetry to engage the senses, Anne Marchand explores universal currents and rhythms by layering paint, texture and words on canvas. Bulgarian sculptor, Orfey Mindov is a teacher by trade and uses each object whether wood, metal or paint as a conduit to teach and emote, giving life through nature. By exploring cultural messages through iconic signs and familiar patterns along with organic and inorganic imagery, Judith Mullen records moments of interaction and response to daily man–made stimuli as juxtaposed to the presence of the natural world around us. Aoife O’Donnell seeks to locate connections between the arts and science through borrowed methods and collaborations. Working with a Professor of Biology in Dublin, the photographer uses microscopes to record images of cells, tissue, DNA and various other effluvia from her family and herself. Roy Wiemann’s paintings are deeply personal emotional moments and memories; an abstract visual diary that is created and fueled by these powerful emotions which illicit a strong visceral response in the viewer. Raising questions of authenticity, distorting perceptions of various media, and multiple manipulations of images are the prevalent themes of this solo exhibit. This exhibit shows artworks in a variety of media and subject matter. The Art League GalleryThroughout history, humans have collected and saved items to remind them of loved ones lost. Artists show work that expresses their interpretation of altars, icons, and reliquaries. A\Work Gallery announces its upcoming exhibition of paintings and assemblages by Maryland-based artist Courtney Miller Bellairs, running October 15 through January 7. The opening reception with the artist will be Saturday, October 15, from 6-8pm. Ms Miller Bellairs’ new work explores ideas and their expression through various materials and forms; works range from hand crafted conceptual sketches and process pieces, to larger works that remain intimate and human in scale. Trained as an architect and artist, Ms. Miller Bellairs’ work explores space, scale, structure and relationships between art and architecture. Through oil and watercolor painting, collage, and most recently assemblage, Ms. Miller Bellairs’ work explores simple objects, cropped and composed to reveal interesting characteristics about light, spatial quality, and the relationships between object and material. Through these images, her work finds the beauty in everyday life. A\Work Gallery is an artwork gallery that wraps around the professional practice of MS&R Architects. It is located in the midst of the Gateway Arts District on the Maryland border of Washington, DC . A\Work Gallery was conceived by architect, professor and art collector Garth Rockcastle to comingle and cross-pollinate many of his professional passions and convictions. The working environment is a flexible and transformative space that combines the integrity of high quality, seasonal art exhibitions, with the rigor of a progressive architecture practice. A\Work Gallery is free and open to the public from 9am-5pm, Monday through Friday. Hyattsville, MD, along the Route 1 corridor. Hasan Elahi is an interdisciplinary artist whose work examines issues of surveillance, simulated time, transport systems, borders and frontiers. His work has been presented in numerous exhibitions at venues such as SITE Santa Fe, Centre Georges Pompidou, Sundance Film Festival, Kassel Kulturbahnhof, and at the Venice Biennale. Elahi recently was invited to speak about his work at the Tate Modern, The Einstein Forum, and at at the American Association of Artificial Intelligence. His work has been supported with grants and sponsorships from the Creative Capital Foundation, Ford Foundation/Philip Morris, and the Asociación Artetik Berrikuntzara in Donostia-San Sebastián in the Basque Country/Spain. His work is frequently in the media and has been covered by The New York Times, Forbes, Wired, CNN, ABC, CBS, NPR, Al Jazeera, Fox, and has also appeared on The Colbert Report. In 2009, he was Resident Faculty and Nancy G. MacGrath Endowed Chair at Skowhegan School of Painting and Sculpture and was a 2010 Alpert/MacDowell fellow. Currently, he is Associate Professor of Art at University of Maryland and Director of the Digital Cultures and Creativity Program in the Honors College.. These are last weeks to see the exhibit. Email me or comment if you wanna go see it and meet me there next week, M-W. In a series of abstract paintings, Anne Marchand explores a new vocabulary of color and texture in the swirling vortexes of nebulae and the surfaces of moons and planets, bringing these into her ongoing search for ways to approach mystic poetry through visual expression. In the show, "Of Shining Worlds: Recent Paintings by Anne Marchand," curator Claudia Rousseau highlights more than 30 paintings by Washington, DC based artist Anne Marchand. The exhibition brings together works inspired by images from the Hubble spacecraft that relate to the artists theme of interconnections. The show at the King Street Gallery, the Morris and Gwendolyn Foundation Arts Center, Montgomery College will open with an artist's reception, on Thursday, September 22, 6:00 - 8:00pm, and remain on display through October 19, 2011. The artist will comment on her work, followed by a poetry reading and live music on Thursday, September 29, 6:00 - 7:00pm. The King Street Gallery is in the atrium of the Morris and Gwendolyn Foundation Arts Center on the west side of the Takoma Park/Silver Spring Campus. Parking is available in the West Garage which is located immediately behind the center. The King Street Gallery is open Monday-Friday, 8:00 AM-4:00 PM; Saturday, 10 AM - 4 PM. The King Street Gallery is the largest exhibition space in the Cafritz Arts Center. This 1050 square foot gallery is in the main atrium of the building. Its prominent location, open design, and extremely high ceilings make it a great venue for major exhibitions. While much of this gallery space is visible from the main lobby of the building, it does maintain gallery hours and is locked after hours. Working in Germany and Southern India, Wolfgang Laib creates objects and installations of austere beauty using natural elements such as milk, pollen, beeswax, and rice. Co-sponsored by The George Washington University, Washington, D.C. The DC Humanities Countil will award the Distinguished Service to the Humanities Award to five recipients this year. The evening's program will include a reception and a discussion moderated by Kojo Nnamdi. Fundraiser tickets are $100 per person, and available here. Organic Plasticity features works by Selin Oguz Balci and Natalie Cheung, highlighting the organic vs. artificial manipulation of forms. The work of Selin Oguz Balci is produced through the stimulation of organisms whose byproducts result in colorful biological close ups reminiscent of scientific texts. The work of Natalie Cheung utilizes the chemical to capture the natural reactions to light and air, leaving behind crystalized formations that evoke forgotten landscapes. Although their methods and materials are very opposing there is a familiarity ever present in the patterns they’ve created.